A Visit to the Alasdair Gray Retrospective Exhibition | Marbella Marbella – Adelante! The winter sun picks out the magnificent red sandstone of the majestic and imposing edifice of Kelvingrove Art Gallery and Museum situated just after Sauchiehall Street merges into Argyle Street, Glasgow. Kelvingrove Art Gallery and Museum is situated where the two main east/west arteries that run through Glasgow meet; where the flow of Glasgow’s life-blood, its beautiful people, pours into the meeting place for the rich and poor. People from all kinds of diverse backgrounds come together on their own personal adventure into the world of art and antiquities. We have to drive past this striking building to access the car park behind only to discover that the back of this awesome structure is really the front due to the engineer misreading the architect’s blueprints. This glorious folly is built back to front! If this building is imposing from the outside it is all the more so once inside. The ground floor is made up of Natural History and historical artefacts as well as smaller showcase exhibitions and a sensible easy-to-find-a-seat cafeteria that takes up most of the expansive atrium. In the basement area there is a restaurant and an exhibition area where the Alasdair Gray Retrospective Exhibition is currently running. 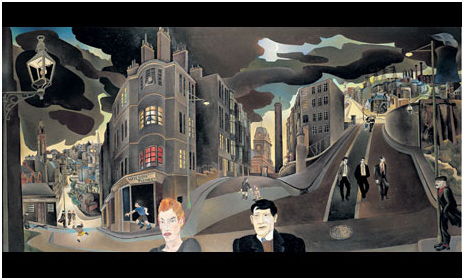 Alasdair Gray is a patriarch of contemporary art in Scotland and this show coincides with his eightieth birthday. I was first won to Alasdair Gray while I was still at school after reading his first and most famous novel called, Lanark. Anyone who can start a book in the middle and end up at the beginning deserves a second look…..
With so many pieces on loan from private collections, this is an exciting opportunity to examine rarely seen works altogether. Many of these works have never been on public display or haven’t been for many years. 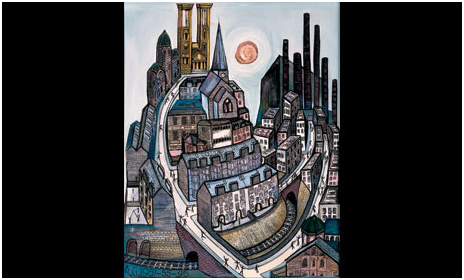 “First painted when I was 15, this crowded together parts of Glasgow that excited me. The twin-towered building was from the theological college on Park Circus, now converted to luxury flats. The synagogue beside it was from Hill Street. The tenements, church, school, railway line, public library were from anywhere, the factory with smoke stacks was reminiscent of Blochairn iron foundry nearer my home. In those days the west of Scotland’s coal-burning industry had many factories, big and small, each with its smoke stack producing in mild weather an overcast grey sky of mist and soot through which the sun before noon often appeared a glowing red disk, bright but not dazzling. In the late 1950s I remember a black sun spot being visible. In cold winter weather this polluted cloud canopy sank as fog into the streets. This picture was painted in weekend children’s art class held in Kelvingrove art gallery and museum by Miss Jean Irwin. This good teacher made Saturday mornings my most predictably happy time between the ages of 11 and 17. She disappointed me only once, and this painting was the occasion. Before having it photographed for reproduction on the class’s 1951-52 exhibition catalogue, a friend told her that the foundry roof could not be looked up to from beneath by someone looking down on roofs beside it. Miss Irwin repainted the roof in accordance with conventional perspective, thus spoiling the composition, which needed the angle of the roof to slope sunward. And of course people in nearby streets would feel the foundry towering above them. I was no enemy of conventional perspective, but knew a picture could combine several viewpoints, therefore as many perspectives. The view you see here is a restoration job carried out years later with guache, pen and ink. This was painted seven years after leaving Glasgow School of Art, but derives from many sketches I made when a student of mural painting there. The single most exciting work of art I knew was the canal across central Scotland from the Clyde to the Forth, with a branch that passed near my Riddrie home on the way to the Lanarkshire coalfields. I made many sketches for a frieze showing the whole length from the Maryhill viaduct to Blackhill locks, both once famous feats of engineering, but now neglected and forgotten. The canal excited me as the ruins of ancient Rome excited Piranesi, but I could not put the six miles I wanted to commemorate in a single picture. This oil painting shows a fragment of what I intended. All but a few distant buildings are demolished now. They existed in 1964, and I have accurately shown how they were related, though the street up to the canal on the right and downhill on the left was one straight slope. When looking from one side to the other you are seeing round 180 degrees from Pinkston Power Station in the north to the tower of St Aloysius Church in the south. This bent perspective means that the distant gas lantern on the right and near one on the left are different views of the same. The picture also has a time shift, the foreground faces belong to the couple whose figures are far downhill to the left. I tried to show several phases of life from childhood to old age. The three young men were copied from a newspaper photograph of them leaving a Glasgow law court, and their clothing style indicates the 1950s, as does the street lighting. Ten years later Victorian gas lanterns no longer survived beside electric lamp posts. For a long time I most appreciated local colours in the gloaming when light was in the sky and streets were lit artificially. From 1967 on, my picture-making was subsidised by commissions to write TV and radio plays. For several reasons these ended in 1976, leaving me dependent on rent from lodgers to whom I sublet rooms in my council house, having some to spare because my wife and I had separated. I also earned meals by decorating a wall in a local restaurant. While doing so one afternoon I was phoned there by Elspeth King, curator of our local history museum, the People’s Palace on Glasgow Green. 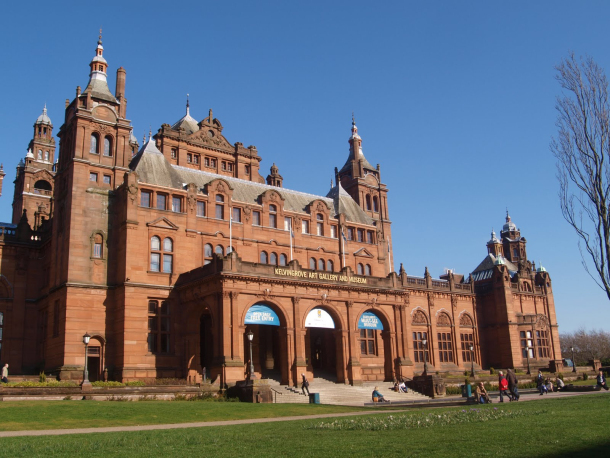 It had been built in 1898 in the city’s east end as a cultural centre, to balance Kelvingrove art gallery and museum in the west, yet it had acquired no paintings of Glasgow places or people later than the early 20th century. Could she employ me to work for the palace as Glasgow’s artist recorder? 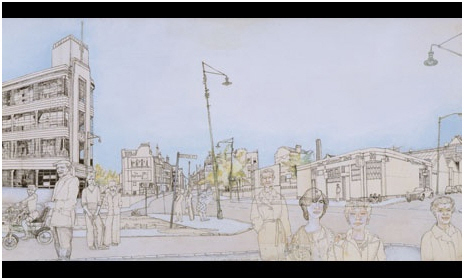 My Cowcaddens Streetscape (seen at a retrospective exhibition where only one work was sold) made her think I might like the job. And I did. Elspeth gave me a well-lit studio space in the palace store in Arcadia Street, Bridgeton. My grandparents had lived in Bridgeton, my dad had worked in a factory here until the second world war, and I had completed my first big mural job in a nearby church, demolished eight or nine years later. I brought to the store sketches of well-known or typical Glaswegians with as much as possible of their everyday surroundings. I brought sketches of nearby streets, many of them semi-demolished because industries were being closed in what had once been a strong working-class district. That summer was unusually sunny so I worked a lot outside, drawing what I could see directly with pencil or Rotring pen. The drawings were pasted on to boards coated with special paint that sealed off acids beneath. Then I tinted them with watercolour, crayon pencil and in a few areas acrylic paint, though I chiefly used it as a background sky. I deliberately kept the colours light, to stop them distracting from the character of the outlines. In this way I finished 33 paintings before reluctantly leaving the job. It is fitting that this retrospective of Alasdair Gray’s life, from student until now, should be housed here in a place that is both an anomaly yet integral to the culture of Glasgow. Alasdair Gray; prophetic writer, seer, sage and influencer upon a jumble of generations who have passed his way. Many were effected some were not. All have continued none the poorer for their experience. 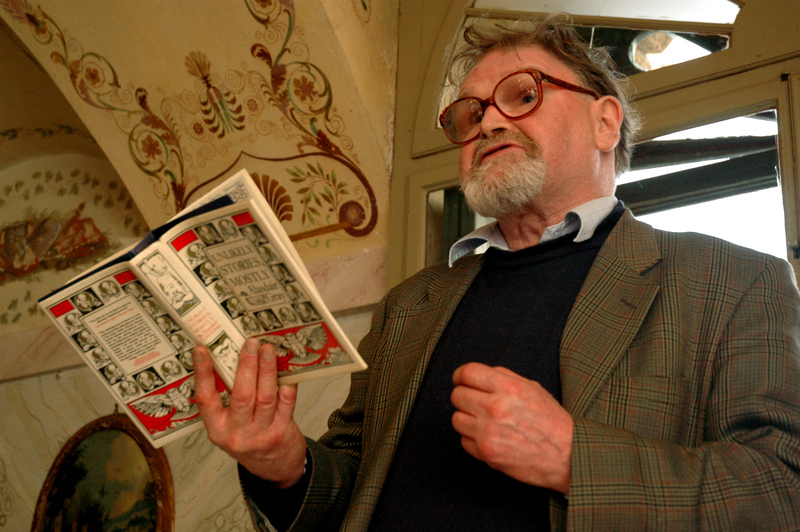 Alasdair Gray’s paintings, drawings, prints, books and plays have toured the world and the world may not even know it. He has influenced both directly and indirectly an unsuspecting public, some gave him credit others did not. There may be a little bit of Alasdair Gray in all of us. If you are passing through Glasgow before February 22nd 2015, tarry a while at this amazing retrospective. Don’t be surprised if you bump into yourself….. Author of “Wee Boys From Glasgow Don’t Cry”. Disclaimer: The views, opinions and positions expressed within this guest article are those of the author Peter Stanway alone and do not represent those of the Marbella Marbella website. The accuracy, completeness and validity of any statements made within this article are not guaranteed. We accept no liability for any errors, omissions or representations. The copyright of this content belongs to Peter Stanway and any liability with regards to infringement of intellectual property rights remains with the author.